It's hard to imagine today what it was like for a woman to live in a time when she had never heard the word lesbian, when there were no lesbian organizations, and when she had to be careful what she wore to the bar because a woman could be arrested simply for wearing pants, or the wrong shoes. 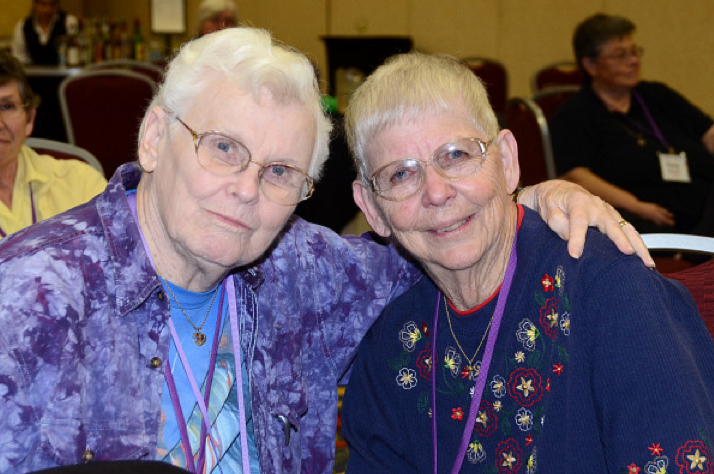 Since the inception of the OLOHP, the Project has worked to gather, document and preserve the life stories of lesbians born in the early decades of the past century. The OLOHP was begun by women of this era, with the singular goal of ensuring that the stories of their contemporaries were preserved and that their experiences were not forgotten. For many a woman, sharing her story with the Project was a significant life experience. For some, it was the first time they felt they had a story worth telling and they were gratified to learn that someone cared. Herstories are filled with insights, revelations, humor, observations and wisdom. Transcripts can be over a hundred pages. Here, we offer a collection of excerpts illustrating a few of the hundreds of valuable thoughts disclosed by the women who have generously shared their life stories. Here on this website, you'll find three forms of excerpts: Quotes, Voices and Profiles. Quotes are shorter pieces and are organized by some broad subject headings. Voices are short samples of the audio from women's interviews. Profiles are a more in depth look at a women's Herstory. Excerpts such as these give us all a glimpse into what it was like for these women to live as lesbians. "We had never held hands out in public. But before they put her in the ambulance I kissed her on the forehead and whispered that I loved her. It was the first ever show of affection." Want to listen to a few samples from interviews? Click here! By now, I’m about 19. My cousins are all leaving home, going into the service, and I thought, “Here I am, 19 and I’m supposed to do something or get married. I guess I’ll have to get married, but I’m going to find somebody that’s good looking, so I’ll have good-looking children.” (laughing) That was the reason I got married! Talk about lame! "I had to give up custody of my children. I knew it was the only thing I could do, for their sake. I didn’t have a job. I had to move out … part of the agreement was that I would be there when they came home, to say good-bye. That in itself was a horrendous scene." For a more in depth look at a few of the completed Herstories, including photos and other support materials, go to the Profile section. Right now, we have profiles posted for nine women, all who were involved in the Project early in it's history, all who led fascinating lives. Most of us have heard the idiom, "Behind every great man stands a great woman." Here in the Project, we're rewriting it: "Behind and by Arden's side stood Arden's 'Sugar', Charlotte"
Charlotte Avery, who was the love of Arden's life for 30+ years, recently died. Arden always acknowledged that the OLOHP could never have been what it became without the support of Charlotte. Much of their life together was shaped by traveling to conduct interviews or give presentations. Charlotte was always there, being supportive, and cheering Arden on. Women who work with the OLOHP in the Puget Sound continue to find places to give presentations about the Project. The next one they are working on will probably be on Whidbey Island in late October. Email us for more details. Participate in the Project yourself. Provide information to someone else you know who may be willing to participate. Request printed material about the OLOHP to distribute in your area. Arrange to do a presentation to a local group. Donate copies of our two books and the DVD+Guide to your local LGBTQ organization, senior center or a care facility. Money Like every organization, money is always needed to make the work happen. Finding Aids We're embarking on an effort to create a finding aid (a type of index) for each of the hundreds of Herstories in our collection. In order to ensure that the wealth of information collected by the OLOHP is preserved, protected, and available to researchers, all the finalized Herstories and associated papers will ultimately be archived in the Sophia Smith Collection at Smith College in Northampton, Massachusetts. About a third of the Herstories are there already. Note sent to the OLOHP: What you have done is so important that I think even you don’t understand it. This will have a life of its own and be around way after we are gone. To have thought this up, seen the need, and assumed the effort to get it done is phenomenal. I really do salute you. TF says: The women that the OLOHP has brought to us have lived remarkable lives, often solitary and private, and we are far richer for knowing these women, their struggles and their passion.